Note: This review was originally published on May 5, 2004. I have changed a few things to update it, but my thoughts on it then basically mirror how I feel about it 7 years later. The war on drugs is an ongoing problem. From ODs to addiction, it is a problem that America has been fighting for too long. 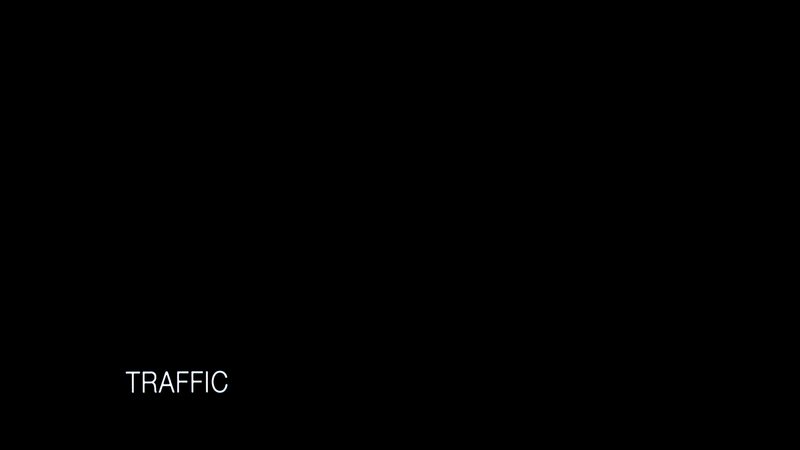 Traffic deals with this issue in a way that I have not seen in other films around the same subject. It dwells even further than others are willing to go and does a tremendous job at it. It exposes the reality of the problem bringing it to light. We see every night on the news and see films with people on drugs, but few movies are so realistic. There are three intersecting storylines involved. The first being in Mexico with Benicio Del Toro plays a Tijuana State police officer hired, along with his partner Monalo, by General Anturo Salazar (Tomas Milian), a Mexican government official who is trying to help in the halting of the drug trade. 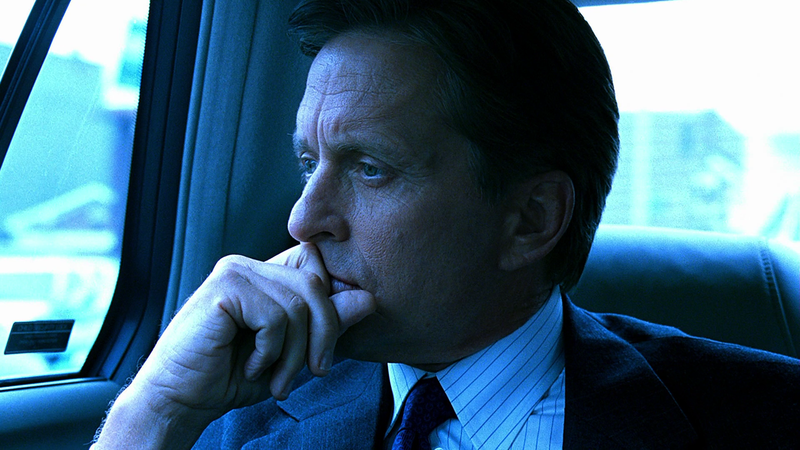 The second storyline concerns Michael Douglas as Robert Wakefield, a man that the President of the United States has appointed the new drug czar. But things are not so peachy when he finds out that his own daughter, Caroline (Erika Christensen) is abusing drugs and getting herself deeper into trouble. And finally the third one headlines Catherine Zeta-Jones as the wife to a big time cocaine dealer. Things get turned upside down for her when her husband is arrested by the DEA and is left alone with her 8 year old son and her unborn child. 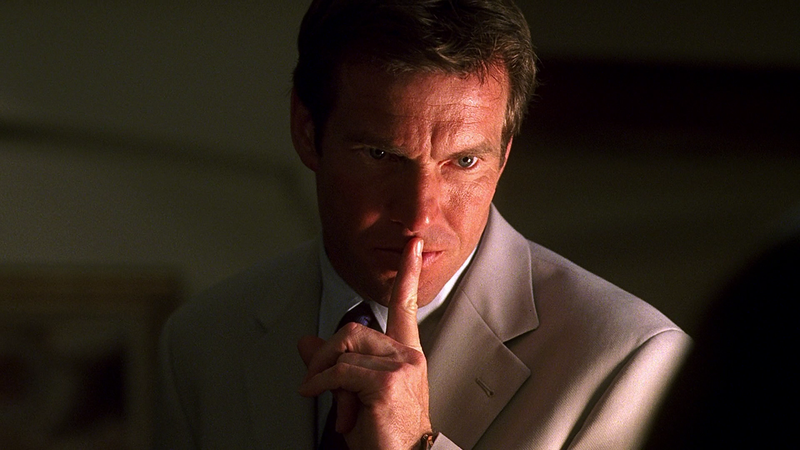 But to her aid comes Dennis Quaid to give her legal advice and tell her the gist of what is happening. The acting is incredible. There is not one person in this entire ensemble that does a poor job; rising actors and veterans alike, they all do a great job. There are many recognizable faces including Don Cheadle who probably made a notable mark for me with this role before furthering his career with strong parts in Hotel Rwanda and The Guard; actor Topher Grace plays Caroline’s boyfriend Seth, primarily of “That 70’s Show” fame. Along with Topher is Erika Christensen who gives a performance that is great, though her career thus far hasn’t exactly taken off. Meanwhile, the veteran cast also pulls their own weight. 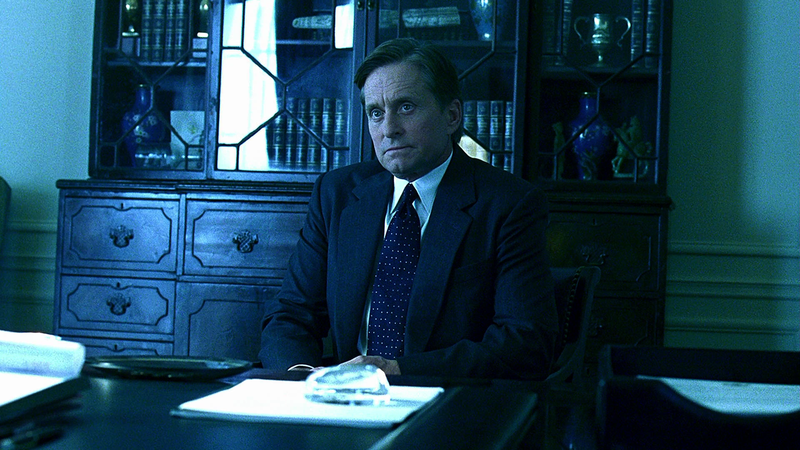 Michael Douglas shines in the background and does a worthy job; his wife Catherine Zeta-Jones has some relative good scenes although is also mainly held in the background, but has a couple important scenes. 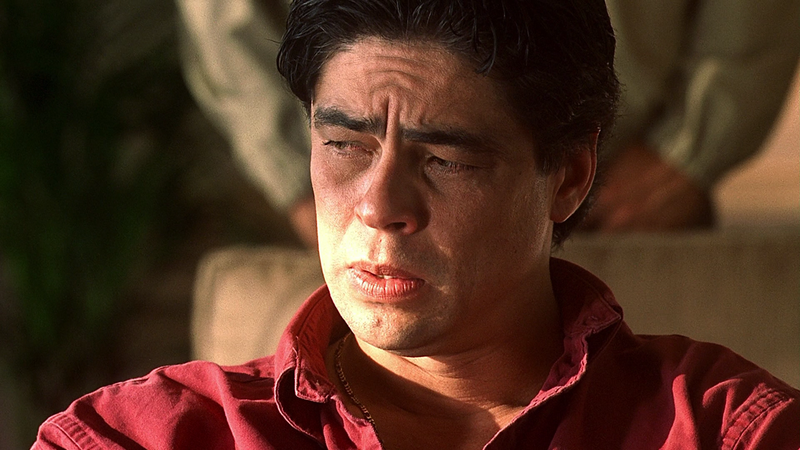 The one that to me was noteworthy was Benicio Del Toro. He gives a great performance deserving of that Academy Award win for Best Supporting Actor. As I said: this is probably the best ensemble cast that I have seen in some time. As far as Stephen Gaghan’s Academy Award winning script goes, it is great. It does a fabulous job intertwining the three stories, like when Benicio Del Toro is driving down the streets in San Diego; it quickly cuts to Catherine Zeta-Jones walking on the sidewalk going the other way. Steven Soderbergh, of Erin Brockovich fame, does a fantastic job on the direction. I was somewhat puzzled on the opening shots when he used a grainy affect (used in Three Kings) for the perspective on Mexico, then a bluish tint for the second story- line concerning Douglas, and finally a glowy orangish for San Diego. It was at first the oddest visuals I have ever seen but after 20 or so minutes it blended in nicely with the rest of the film. The film is based upon the BBC mini-series Traffik created by Simon Moore. Soderbergh has stamped his own signature on each of his films. They seem to have that type of look, mainly consisting of the bluish tint I talked about, and some unorthodox ways of directing. Overall, Traffic is a film that will not be forgotten in my mind. For me to give a movie this much praise I have some simple criteria – aside from the usual such as acting, script, direction, etc. – the main one is how much the film makes me think about that certain issue it brought forth to the audience, after the film is over. This one certainly did that. It is an engrossing movie that, if you haven’t already seen it, I would highly recommend. The Blu-ray comes inside Criterion’s clear HD Keep Case. Inside is an insert identical to the one that came with the DVD version. It contains an essay, information on the transfer, cast and crew credits and the chapter list. There might not be a comprehensive making-of documentary, but these features together almost makes up for it. Feature Commentaries – The first track is with Director Steven Soderbergh and Writer Stephen Gaghan where the pair goes in-depth about writing the script and filming various scenes. One of the more interesting factoids is how Soderbergh efficiently used the sets to keep the budget down; Track two is with Producers Laura Bickford, Edward Zwick and Marshall Herskovitz and Consultants Tim Golden and Craig Chretien. 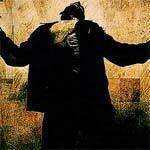 This track is a bit on the dry side but with so many participants, you do get a variety of info from each one (and from what I could tell, they are spliced together; the last track features Composer Cliff Martinez as he explains where he came up with the sounds and gets specific for this or that scene. It’s not very interesting but budding composers might enjoy it. Demonstrations (TRT 36:42; SD) – There are three sets of demonstrations: Film Processing (5:51), Editing (17:20) and Dialogue Editing (13:31). The first breaks down the opening scene in Mexico, showing each stage of color adjustments, etc. in multiple steps; the second has the editor commenting on how a scene is pieced together line by line; and the last one is basically the same. Deleted Scenes (26:54; SD) – There are 25 scenes removed or cropped and while none of them are of particular interest, there are a couple highlights. One is more character moments with Catherine Zeta Jones showing her character change while another has Michael Douglas’ and Benicio Del Toro’s characters crossing paths. Additional Footage (TRT 39:40; SD) features multiple angles from scenes of the EPIC (El Paso Intelligence Center) and the cocktail party where the judge (Douglas) makes his rounds to different senators, celebrities and lobbyists as they state their views on the war on drugs. The EPIC scene is long and dry but it is interesting to switch from three different angles. The cocktail party while long (25 minutes) does have some interesting things in it as real life senators talk about their views without a script. Last on the disc are Trailers (TRT 6:13; SD) – 2 Theatrical and 5 TV Spots – and Trading Cards where you can check out stats on K-9 drug dogs. It’s cute but mostly useless. Traffic has undergone a variety of transfers twice on DVD and now twice on Blu-ray. I quickly compared the recently released Universal BD with Criterion’s and other than the aspect ratio (1.78 vs. 1.85), it seems nearly identical. The transfer is fairly consistent even when going from the darker blues to the brighter, oversaturated scenes, in each instance there was a fair amount of film grain while the detail level was great all around. For the most part, this is a Blu-ray that does pop off the smaller screen. The disc offers up two DTS-HD Master Audio tracks, one is 5.1 while the other is 2.0 surround. The default track (5.1) isn’t what I would say that fantastic sounding, but it gets the job done. Most of the action takes place in the center channel with more ambient noises and Martinez’s score getting help in the front and rear speakers. Dialogue levels are steady and clear throughout. 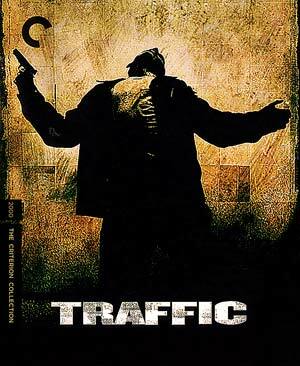 Overall, Traffic still is as engrossing today as it was the first day I saw it in the theaters 11 years ago. 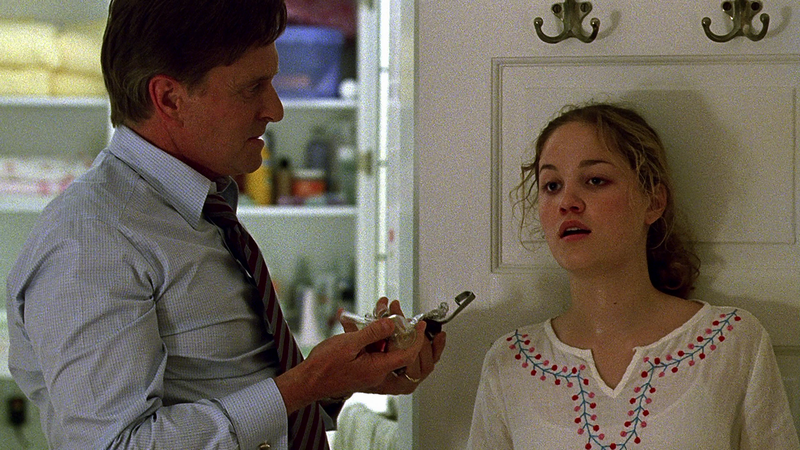 The performances all around are fantastic while Soderbergh’s style, now a standard for him, was unique and beautiful. When it comes to the Criterion Blu-ray release, I’d say it’s on par in the video and audio realm as the Universal release but obviously this is the edition to go with as it contains several featurettes and commentaries. This is a no-brain purchase for any fans of the film.